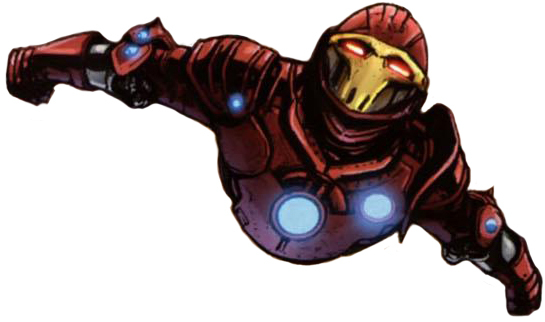 Thanks to the Repulsor Tech node implanted in his chest, which is linked to his brain, Tony is able to interact with different types of energies and forces a normal human cannot. The R.T. node acts like a new sense for its user. The reactor's excessive generation of energy provides Stark with an increased amount of intelligence and gives him superhuman-level multitasking and learning capabilities. Enhanced Abilities:: The R.T. node allows who possesses it to have a greater strength, speed agility and endurance. Enhanced Healing and Durability: It has been shown that an user of an R.T. node not only recovers incredibly fast from different types of injuries, but also to resist more physical damage than an average human. Energy Emanation: The R.T. node not only provides repulsor energy to run devices such as the Iron Man Armor, its user can produce beams of energy at will, possibly weaker and less directed than the Uni-Beam. Magnetic Force-Field: The R.T. node creates a force-field which can be modified at will by its user by incrementing the power of the Reactor. It can be so powerful to destroy bullets or repel people. It can be so powerful to surpass an electromagnetic field generated by Electro. Electrical Fields Detection: As the R.T. node is connected to Tony, he can feel different electrical fields that the Reactor is picking up. This includes all kinds of invisible frequencies. Levitation: The magnetic force-field generated by the Reactor can interfere the ones created by the planet and levitate. It's unknown if this interaction can be used to fly. Enhanced Senses: The reactor also increases the senses of its user, allowing Tony to "hear better". Immortality: Dark Iron Man is functionally immortal and cannot be killed by conventional means, thanks to the entity “Death” dying in his universe. After the Cancerverse was corrupted by the Many-Angled Ones and Death was vanquished by Lord Marvel, Iron Man and his fellow Avengers were corrupted and placed under Mar-Vell's service, now calling themselves The Revengers. They fought against the forces of Earth-616 in an attempt to corrupt that reality as well.